Really awesome album and a Masterpiece! 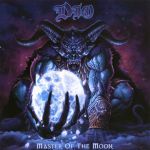 Sadly this was Dio's last studio album before lead singer Ronnie James Dio died in May 2010 (R.I.P). The title track is a standout though none of the tracks are bad.